The Great War is characterised by the massive destruction it caused and the fighting at Verdun in 1916 is perhaps the most frightening example of modern industrial warfare waged on a people and the landscape that they inhabit. It was part of a new 20th century ethos the; utter destruction of a nation and its people. The devastation was so extreme that villages were wiped from the map and medieval visions of hell became a reality for the first time. The landscape was forever changed all along the Western Front, as Sillars puts it, “The natural landscape which remains after battle has a similar quality of terrible unreality, both in itself and in the way it altered men’s lives. Forests are destroyed, and only the dead remain above ground, while the living shelter beneath”, (Sillars 1987: 2). An archaeologist must look at conflict in the twentieth century and its legacies using a multi-disciplinary and multi-sensorial attitude to examine areas of interest that are still to some extent in the collective memory. To understand the battle of Verdun and its far-reaching implications it is important to go beyond the constraints of a traditional Military History perspective. This work will explore the changing nature of the landscape of Verdun as it progressed from one of conflict through to one of remembrance, tourism and change. It will discuss the destruction of the area and the steps taken to rebuild the shattered city and it’s surroundings after the war. Saunders states that “fundamentally, war is the transformation of matter through the agency of destruction; the character of modern technological warfare is such that it simultaneously creates and destroys more than any previous kind of conflict” (Saunders 2004: 5). At Verdun this transformation of matter can be seen in its most extreme forms both from the destruction caused by the incessant use of heavy artillery and also by the altering of the landscape before the battle to incorporate huge forts and underground “cities” which could withstand almost constant shelling. Verdun stands at the crossing point of two communication routes – the river Meuse and the old road from Paris to Eastern France. The area is surrounded by hills and the river Meuse has cut into both sides of the valley leaving interlocking spurs that dominate the river crossings. On the eastern side – facing the German border – the hills form high cliffs and steep sided ravines that concentrate communication routes into a few natural gateways and offer many natural defensive positions (Holstein 2009: 9). The landscape offered protection to the attacking Germans as well as the defending French with the woods and valleys offering some sort of protection against aerial observation, (Duffy 2007: 326). The landscape was a prepared battlefield. The fortifications consisted of a double ring of 28 modern, mutually supporting forts set into and using the contours of the land to great effect, as well as a huge number of secondary military installations. By 1916 a salient had developed in the French lines caused by the prominence of the city’s defences. On the west side of the river, the heavily fortified positions of Le Mort Homme and Hill 304 covered the German positions in the north west, as well as the approaches to the main forts of Douaumont and Vaux on the east side of the river, (See Duffy 2007, Horne 1993 and Holstein 2009). These forts were immense in size, heavily defended by many types of weaponry and utilised the landscape to their advantage. They were actually built deep into the earth itself, (Figure 1), altering it in a way that would not have occurred but for the need for protection from the modern weapons of war, (see Horne 1993, Ousby 2002 and Holstein 2009). The European Landscape Convention defines landscape as “an area, as perceived by people, whose character is the result of the action and interaction of natural and/or human factors” (Schofield 2005: 43). At Verdun the character of the landscape was changed irreversibly. A pilot noted after flying over the city, “there is only that sinister brown belt, a strip of murdered nature. It seems to belong to another world. Every sign of humanity has been swept away. The woods and roads have vanished like chalk wiped from a blackboard; of the villages nothing remains but grey smears…. Countless towers of smoke remind me of one of Gustave Dore’s pictures of the fiery tombs of the arch-heretics in Dante’s Hell….” (Horne 1993: 173-174). The ferocity of the fighting for Le Mort Homme caused 10 metres to be blasted away from its summit, reducing its height from 295m to 285m (Holstein 2009: 49). The battlefield, churned up through months of constant shelling, forced the soldiers to live with the rotting corpses of their comrades and the constant stench of death. A French officer, Major Roman described the scene at the entrance to his dugout in June 1916 as follows, “On my arrival, the corpse of an infantryman in a blue cap partially emerges from this compound of earth, stones and unidentifiable debris. But a few hours later, it is no longer the same; he has disappeared and has been replaced by a Tirailleur in khaki. And successively there appear other corpses in other uniforms. The shell that buries one disinters another. One gets acclimatised, however to this spectacle; one can bear the horrible odour of this charnel house in which one lives, but one’s joie de vivre, after the war, will be eternally poisoned by it.” (Horne 1993: 302). The effect of such conditions on the men fighting at Verdun cannot be underestimated (Figure 2). This personal idea of their landscape is as valid as the view seen on maps and aerial photography. It is a view of landscape on a scale at which the soldiers themselves would have understood and experienced the battle, their ‘mental landscape’, and is important to a Conflict Archaeologist when examining a conflict landscape (Schofield 2005: 46). Saunders describes the Great War battlefields as “composed variously of industrial slaughterhouses, vast tombs for the ‘missing’, places for returning refugees and contested reconstruction, popular tourist destinations. Locations of memorials and pilgrimage, sites for archaeological research and cultural heritage development, and still deadly places full of unexploded shells and bombs” (Saunders 2004: 8). President Poincare said even before the end of the war that the battlefield had a future as well as a past: “Yet Verdun will again be born from its ashes; the destroyed and deserted villages will rise afresh from their ruins; too long exiled, their inhabitants will come back to their rebuilt homes; under the protection of a victorious peace, this ravaged countryside will recover the laughing face it wore in happy times.” (Ousby 2002: 263). As good a sentiment as this was, it proved to be somewhat untrue. The reality was that the villages to which Poincare referred had simply ceased to exist. After the battle Henry Bordeaux walked across the village of Feury without even realising that it was there (Ousby 2002: 265). In the words of Louis Gillet, a staff officer who wrote a history of the battle, the village had become “nothing”. “The whole place has returned into dust, with the bones of thousands of adversaries who rushed here pell-mell, a chaos of shadows in this village of shadows” (Ousby 2002: 265). Today the streets of the village are marked out with white posts and these are the only evidence of its existence (Figure 3). Many of the villages inside the Zones Rouges, such as Fleury had monuments built in place of the buildings to memorialise the sacrifice of the small habitations (Webster 1998: 64). The village of Malancourt, to the west of Verdun was totally destroyed in the war. Although it was partially rebuilt in the 1920’s, 90% of its population never returned. Indeed only 80 people lived there in 1999 (Filippucchi in press 2009). Malancourt was one of the villages decorated with the medal of ‘Martyr Villages’ in recognition of its sacrifice (Filippucchi In press 2009). As William MacDonald remarked, “Nowhere in France is there now to be seen a more vivid combination of rugged country dotted with the remains of forts and artillery emplacements, of soil torn by trenches, shell holes, and mine craters, and of forests shattered by shellfire, and towns and villages in ruins. From whatever quarter one approaches Verdun, the ravages of war stand out on every Hand”, (Macdonald 1922: 6 Quoted in Clout 1996: 37). The countryside around Verdun, once so fertile, refused to be bear life in the immediate aftermath of the battle. The soil had been sifted over so many times that it had the consistency of sand and was full of the detritus of battle; all attempts to grow plants and trees were unsuccessful. Several efforts to reforest Le Mort Homme failed – the battlefield was to remain a “Dead World” (Ousby 2002: 265). The devastation was so severe that some 185,000 hectares of forest had been destroyed and it took until the end of 1926 and cost nearly 2, 249,000 francs to clear, (Forget 1928: 3-4 – My translation). Over half of the oak, beech and hornbeam trees were damaged as a result of the fighting, (Magny 1928: 123, Quoted in Clout 1996: 37) and in order to help with the replanting of the forests, between 1921 and 1922 Germany provided 153,000 small conifer trees along with 1,400 kilos of acorns and 180 kilos of resin tree seeds as part of their war reparations, (Forget 1928: 5 – My translation). The French were keen to promote the use of heavy machinery to help rebuild the land and formed the “Service de la Motoculture” in 1917 (Clout 1996: 109). Quaker volunteers ploughed the fields around Verdun to make the place more attractive to returning farmers (Clout 1996: 76), but the fragmentation of land ownership around Verdun made it difficult to use large machines to clear the debris and agricultural revival was thereby hindered. However this improved when the French and British armies became involved in the recovery of the land, (Clout 1996: 64). This sort of effort was essential to try and rebuild the shattered country as quickly as possible and let the refugees return – In 1918 the population around Verdun stood at a mere 9% of its pre-war total, (Clout 1996: 54). These sort of efforts were going on all along the Western Front as France attempted to rid itself of the leftovers of war, but at Verdun things moved slower than elsewhere as the intensity of the destruction meant it was deemed too dangerous to quickly cultivate the land, (Clout 1996: 159). Classification of the land with a view to what would happen to it in the future was a difficult and protracted affair. It was undertaken by the Service de la Reconstruction Fonciere with consultation with the local forestry and agricultural organisations, as well as local residents (Clout 1996: 269). Often the decisions proved to be highly contentious, as is demonstrated by the case of the village of Grémilly, about 8km north east of Douaumont. The inhabitants of the village had returned and formed a cooperative reconstruction society, which was approved by the authorities of Meuse. However, as the village lay within the Zones Rouges, any sort of permanent housing was forbidden and as late as 1925 the residents were living in temporary camps on the edge of the ruins, (Clout 1996: 269). 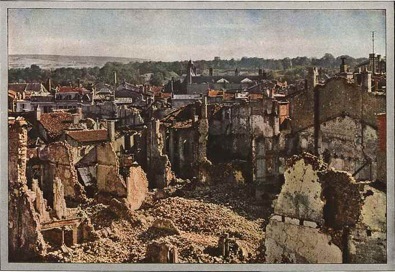 The city of Verdun itself was terribly damaged during the fighting (Figure 4). In 1919 it was estimated that 2,305 residential buildings had been destroyed during the battle, (Delbreil et al 1997: 182 – My translation). Indeed there were parallels drawn between Pompeii and Verdun due to the devastation inflicted on both cities, (Meyer 2007: 13 – My translation). The Meuse Department handled urban and industrial development in the area of Verdun and it instructed a group of Parisian architects known as “La Cite Nouvelle”, to lead the rebuilding project, the cost of which was partially provided for by London and the Great Duke of Luxembourg, who adopted the city after the war, (Delbreil et al 1997: 182 – My translation). Unfortunately, the large amount of red tape and government administration slowed the process down, (Meyer 2007: 6 – My translation). The debate over the future of the city was intense but brief. The outcome was that the city was to be rebuilt, making sure to preserve some of the destruction so that the battle would not be forgotten, (Meyer 2007: 16 – My translation). The part of the town on the West bank that suffered the worst during the fighting was to be left in its ruined condition as a memorial to the battle and to respect the unique testimony of what happened there, almost as a scientific example of the barbarism of man, (Meyer 2007: 13 – My translation). As early as 1916 General Dubois (a historian, archaeologist and artist with close ties to Verdun) and the Verdun council corresponded over the future of the city. Dubois’ view was that the ancient Roman and Medieval Arched entrance to the city, which remained in tact despite the shelling, should form the focal point of the new city, (Meyer 2007: 7 – My translation). The council wanted the rebuild to be a modern one, corresponding to the modern notion of traffic and looking to the future, however it was to be done without neglecting the history and the military aspects of the town (Meyer 2007: 9 – My translation). A grand main avenue that linked the old station to the proposed new docks was to be built and the city was to be more suited to modern life. It was important that the station was linked to the new docks so that the materials for the rebuild could be easily moved to where they were needed and the restoration of the cathedral was of the utmost importance, and was to symbolise the rebirth of the city, (Delbreil et al 1997: 183 – My translation). To help with the cost, the city took out a loan with the government in the amount of 15m Francs. It was approved 1920 and in 1921 the loan was increased to 60m Francs as the costs spiralled, (Meyer 2007: 32 – My Translation). There was already the notion that tourists from all over France would visit the city – hence the modern outlook and progressive feel of the rebuild, (Meyer 2007: 7 – My translation). Before the war had finished ‘tourists’ began to travel to the battlefield. In 1917, a former mayor of Verdun, Péquart, described observing several groups of tourists and schoolchildren walking around the old town and on each street the state had stationed a wounded veteran of the battle to provide commentary (Sherman 1999: 37). Almost as soon as the armistice was signed the Office National du Tourisme was working to establish tent hotels and roads for visitors to the battle-site, but due to the enormity of the destruction, actually getting to the area was difficult and indeed it was not until late 1921 that regular train and bus services were re-established (Sherman 1999: 37). As the landscape changed it’s nature the battlefield inevitably claimed more victims. 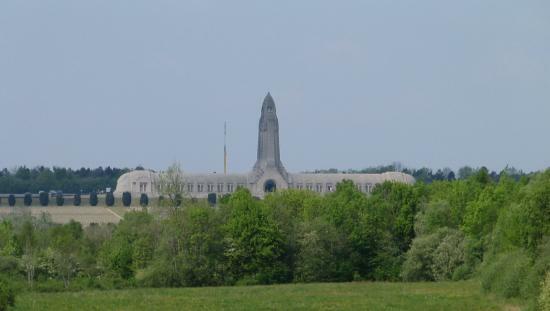 Each spring during the 1920’s a Catholic school in Tourcoing sent a group of boys to cycle around the battlefields and gather fragments of remains, which were turned over to the ossuary at Douaumont (Sherman 1999: 48). In 1929 a priest and a student from the Tourcoing group were killed when a campfire they had lit set off an unexploded shell (Sherman 1999: 48). This incident highlights an important factor of modern warfare: the ability of the weaponry to kill long after the fighting has stopped. Saunders explains (Saunders 2004: 18) how the speed of reconstruction after the war left whole battlefields intact, with lethal unexploded ordnance as well as bodies just beneath the surface. “The Western tradition of memory since the Renaissance has been founded upon the assumption that material objects, whether natural or artificial, can act as the analogues of human memory. It has been generally taken for granted that memories formed in the mind can be transferred to solid material objects, which can come to stand for memories and, by virtue of their durability, either prolong or preserve indefinitely beyond their purely mental existence” (Forty 1999: 2, quoted in Schofield 2005: 93). At Verdun there are many of these material objects that conduct memory, in the form of cemeteries and more grandiose monuments such as the ossuary at Douaumont (Figure 5). Bodies that could be identified were buried in the cemeteries and those that could not, or were only partial, were interred in ossuaries. The grand ossuary at Douaumont is a huge structure of remembrance containing elements of all the major faiths, but centred on a large Catholic chapel. The ossuary is reminiscent of a huge sword sticking into the earth with only the handle and guard visible above ground, (see Ousby 2002, Sherman 1999 and Holstein 2009) and it is a landscape where the dead vastly outnumber the living (Ousby 2002: 268). Often friendships between the bereaved were struck up at these vast monuments as relatives sought the solace and understanding of others, (Winter 1995: 52), which may have helped to heal the mental wounds. Buchli and Lucas argue that, “in every memorial, something has been left out or forgotten…. It is what is not there, what is absent that causes the tension”, (Buchli and Lucas 2001: 80). The huge number of ‘missing’ soldiers, vanished without a trace into the mud or vaporised under the heavy bombardments are also represented by the ossuary. It combines selective lists of names with fragments of bodies that might or might not correspond to them in one large structure. Although there were many objections to this type of memorial, it did provide families of the missing with “the consolation or the illusion of believing that in that place there is something of their children” (Sherman 1999: 92). 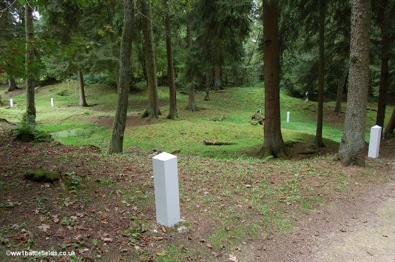 Beside these resting places of the dead and missing are other memorials such as the Tranchée des Baionettes, representing a squad of soldiers supposed to have been killed standing at their posts under bombardment, all that was left were their rifles and bayonets protruding from the ground. It became the “stuff of myth”, (Winter 1995: 99) and although perhaps misleading about the reality of death under heavy bombardment, it became a powerful place for visitors after the war, standing for the French attitude of ‘Ils ne passeront pas!’ (See Horne 1993, Ousby 2002). Today Verdun still bears the scars of the First World War, indeed the area is still so damaged and unnatural looking that it can be noticed from space (Webster 1998: 63). Shelling destroyed much of the city, but gradually after the war the residents returned and rebuilt their homes and shops and turned the city into a living part of France again – the sugared almonds made at Verdun are now famous across the country, (Webster 1998: 73). The evidence of war is still to be seen both in the city and the surrounding countryside. For example shrapnel marks can still be noticed on the local Jesuit college chapel, (Webster 1998: 73), and from Fort Douaumont’s roof it is possible to see blank areas of forest where still nothing will grow and the land is “dead and gray”, (Webster 1998: 67). It is doubtful that anything will grow there ever again. Verdun has become a palimpsest, created by the destruction of the war. Before the Great War it already had a rich history of conflict and to some extent had always been a contested and conflict landscape. The Germans use of the city as a way of destroying a nation was something new to warfare, made possible by the advent of industrial killing weapons and of a defensive landscape, which was bitterly fought over, time and time again. The horror of the battle became indelibly ingrained on the minds of those who fought there and who bore witness to the terrible nature of modern war. Ironically, it was the Germans, not the French, who learned the lessons of how to wage this new type of war: the French experience at Verdun seems to have persuaded them to regress back to a philosophy that had already proved to be outdated and unworkable and it was to cost them dearly in the Second World War. 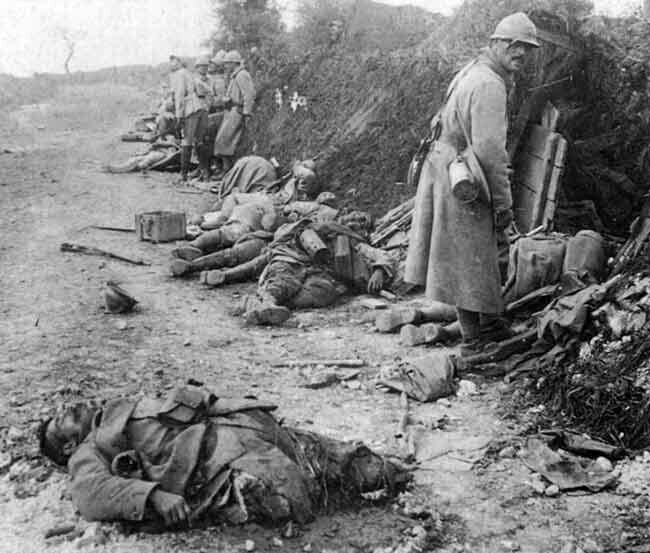 The French felt it important that the wounds never truly heal lest the sacrifice for Verdun be eventually forgotten. Even today the area around Verdun is still extremely dangerous. Signs still warn visitors of the dangers, saying such things as “Picnicking Allowed Inside This Area”, as Webster puts it, “Spots for Al Fresco Sunday afternoons have been carved between the shells”, (Webster 1998: 64). Today Verdun stands as a permanent memorial to the men who fought and died there, completely dominated by modern warfare and the modern weapons they used. Indeed the case of the collective memory of Verdun is such that often earth from the battlefield was placed in an urn in front of war memorials all over France to symbolise the sacrifice there, (Spiering M and Wintle M 2002: 91). The area is a conflict landscape that has changed from one of battle through to one of memory and tourism. It is a symbol of how 20th century warfare can totally destroy everything that it comes in contact with and how the new weapons of 1914 were too powerful for their masters to control. Buchli, V and Lucas, G. (2001). Archaeologies of The Contemporary Past. London: Routledge. Clout, H .(1996). After The Ruins: Restoring the Countryside of Northern France after the Great War. Exeter: Exeter University Press. Delbreil, J, C. Gallet, J. Girardot ,A and Streiff, J, P. (1997). Histoire De Verdun. Metz, Editions Serpenoise (Translation by Florence Lenegre). Filippucci, P. (In Press). ‘In a Ruined Country: place and the memory of war destruction in Argonne (France)’ in N, Argenti and K, Schramm. (eds.) Remembering Violence: Anthropological Perspectives on Intergenerational Transmission. Berghahn Books. Forget, J. (1928). Reconstitution forestiere et la Zone Rouge dans la Meuse. Extrait du Bulletin de la Societe des Lettres, Sciences et Arts de Bar-le-Duc, Julliet-decembre 1927. Bar-Le-Duc. (Translation by Florence Lenegre). Holstein, C. (2009). Walking Verdun: A guide to the Battlefield. Barnsley: Pen and Sword Books Ltd.
Horne, A. (1993). The Price of Glory Verdun 1916. London: Penguin Books. Meyer, F. (2007). Verdun Des ravages A La Renaissance 1915-1929. Volume 2 Le Verdun Nouveau 1919-1929. Conaissance De La Meuse. (Translation by Florence Lenegre). Ousby, I. (2002). The road to Verdun: France, nationalism and the First World War. London: Jonathan Cape. Saunders, N, J. (ed). (2004). Matters of Conflict, Material culture, memory and the First World War. London: Routledge. Schofield, J. (2005). Combat Archaeology Material Culture and Modern Conflict. London: Gerald Duckworth and Co Ltd.
Sherman, D, J. (1999). The construction of memory in interwar France. Chicago: University of Chicago Press. Sillars, S. (1987). Art and Survival in First World War Britain. London: The MacMillan Press Ltd.
Spiering, M and Wintle, M. (2002). Ideas of Europe since 1914: The Legacy of the First World War. New York: Palgrave. Webster, D. (1998). Aftermath: The Remnants of War. New York: Vintage Books. Winter, J. (1995). Sites of Memory, Sites of Mourning; The Great War in European cultural history. Cambridge: Cambridge University Press. Excellent ! semi retired teacher NZ – History major .